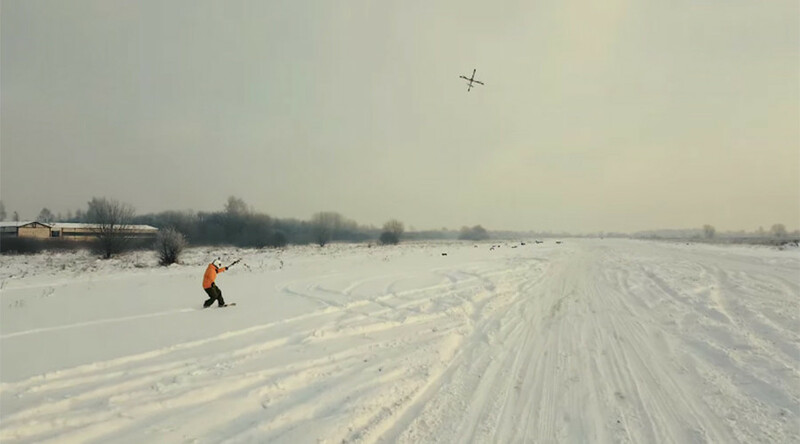 An experimental robot company is injecting an exciting buzz into Latvian winter sports by using drones to pull snowboarders across the slopes. Latvia’s Aerones has already used heavy duty flying bots to douse flames and simulate a water rescue mission. Now footage has emerged of daredevil snowboarders using the tech to race across powdery slopes. With heavy load transport capabilities, the drones have also been tipped to play a role in construction. He told AFP TV that his team came up with the novel snowboarding brainwave one afternoon about two years ago. “The idea of drone boarding was basically like a Friday afternoon idea. We had the drone and we thought with winter outside, let’s go and try it,” he said. Footage shows the 16-rotor machines soaring through the air while pulling the weight of four weaving snowboarders. The Latvian drone manufacturer has been busy experimenting with the machines for some time now. In 2016, one of the firm’s ’copters successfully pulled a wakeboarder down a stretch of the Daugava river. According to Aerones, the drone reached a top speed of 70kph (112mph) and completed a distance of 2.6km. Video of the amazing feat reveals how the wakeboarder was able to keep pace with a speedboat and even gain some gnarly air time. A similar drone took on the work of a firefighter earlier this month when it put out a blaze in a tower.